We have inflatable penalty shootout games available in both small and large sizes. They make for great competitive entertainment at all events whether it be a corporate funday to a party for football made kids! Similar to a Penalty Shootout we also have the Football Speed Cage where the participant kicks the football into the inflatable enclosure as hard as they can and the speed of the shot is registered and displayed by a radar unit. These football shootouts are great for fun days and fetes and go down especially well alongside the football themed Bouncy Castle and Human Table Football. 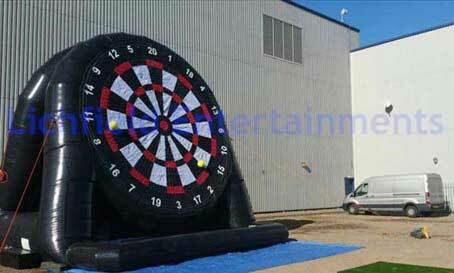 Our giant Kick n Stick game is a cross between a penalty shoot and darts. We have two different sizes of this game available - one 15ft tall and the other a massive 26ft tall! These giant boards are brilliant centre pieces guaranteed to grab everyones attention at fun days and promotional events alike. Supplied staffed as standard and you'll need an overall operating area of at least 20x30ft for the smaller one and 50x60ft for the larger one. If you have any queries, questions or would like to hire a Penalty Shootout inflatable, Football Speed Cage, or Giant Kick n Stick please click here to enquire and we will do all we can to help.